20UNDER40 is the epitome of a grassroots effort. Founded on hard work and commitment to an ideal, the 20UNDER40 project has subsisted off of the sweat of its founders (and their friends!) for nearly two years. Now an international phenomenon and rising change agent in the arts, 20UNDER40 needs more resources—and more support—than ever before. Now there are two ways for you to show your commitment to the future of the arts: Contribute to our online fund raising campaign, or become a 20UNDER40 insider through our Ambassador’s Program. Remember that 20UNDER40 is a fiscally sponsored project of Fractured Atlas. 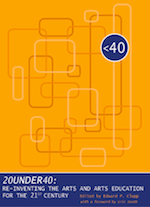 All contributions to 20UNDER40 are tax deductible to the extent allowed by law. We would like to express our extreme gratitude to all those who joined the 20UNDER40 Editor’s Circle by contributing to our IndieGoGo campaign. Thank you! 20UNDER40 is a sponsored project of Fractured Atlas. 2010 © www.20UNDER40.org, All Rights Reserved.